Pest description and crop damage Three species of flea beetles-the western potato flea beetle (E. subcrinita), the tobacco flea beetle (E. hirtipennis), and the tuber flea beetle (E. tuberis)-are known foliage feeders in Pacific Northwest potato fields, especially west of the Cascades. Of these, only the tuber flea beetle seriously injures potato tubers. All three species have yellowish-brown legs. The tuber flea beetle tends to be dull black, whereas in bright light the western potato flea beetle has a distinct bronze luster. The tobacco flea beetle tends to be brownish in color with a darker brown to black irregular band across the elytra. 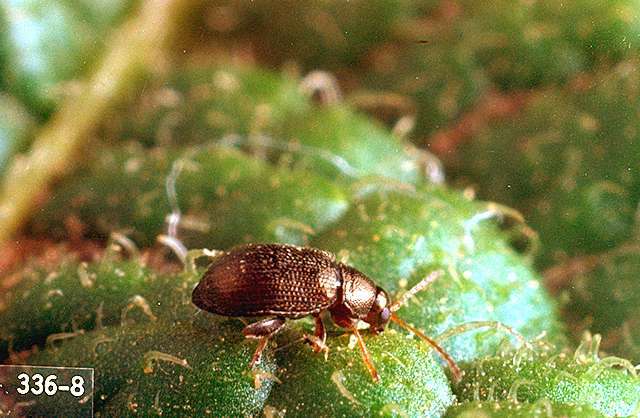 It is not unusual to find flea beetles of the genus Phyllotreta in potato fields feeding on various weeds. The flea beetles that do not feed on potatoes have black legs. Oregon surveys indicate that only the western potato flea beetle is in potato fields of Malheur, Baker, and Klamath counties. Although once in heavy numbers in Deschutes, Crook, and Jefferson counties, the tuber flea beetle has not been a problem in these areas for several years. West of the Cascades, tuber flea beetle has become a serious problem in some areas, particularly the Skagit Valley of Washington. The damage to potato tubers by the tuber flea beetle is almost identical to that of symphylans. Both tuber flea beetles and symphylans sometimes live in the same field. Adults chew minute circular holes on the leaves producing shot-holes pattern. Tuber damage consists of shallow subsurface wavy furrows. Biology and life history Tuber flea beetle adults overwinter buried in the soil in and around potato fields. Overwinter survival appears to be highest in elevated, grassy headland regions unaffected by field flooding. There are two to three generations annually in growing areas west of the Cascade Mountains, which are the areas primarily affected by flea beetles. The first generation begins with the overwintered adult flight from late May to late June. Mating and egg laying can continue for up to a month. Generally, the larval stage takes about 3 weeks to complete, followed by a 2-week pupation period. First generation larvae feed from early June to mid-July, second generation from mid-July to mid-August, and third generation from mid-August to mid-September. The second and third generation larval damage is of particular importance to the late crop potato varieties. The life cycle normally is completed in about 6 weeks. The soil-dwelling larvae are likely affected by nematode parasites and fungal diseases, as well as predatory beetles such as ground beetles, and rove beetles. The active adult stage is likely most affected by spiders. Apply in late May when beetles appear on foliage, directing treatment where stems of potato vines enter soil. No tuber treatments against flea beetles are available for home garden vegetables. Foliar insecticide applications are recommended for control of the tuber flea beetle. This type of control is directed against the adult beetles, killing them before they can deposit eggs. Soil applied insecticides and seed treatment products are also available to control both larvae and adults of flea beetles. A number of chemicals are registered for controlling this beetle on potato (See Table). If needed, the initial foliar application usually is when 50 to 66% of potato plants have emerged. Applications should be repeated weekly or at 10 day intervals, or when adult beetles reach or exceed 10 beetles per 50 sweeps of a standard 15-inch sweep net. In the Willamette Valley, observations indicate that sweep samples may be unreliable for potatoes just emerging through the ground. As few as two beetles per 25 sweeps on borders of fields of young, emerging potatoes may be an economic infestation. Occasionally, border sprays may be all that is necessary on just-emerging potatoes. Flea beetles can become a severe problem in second-year fields; therefore, crop rotation is encouraged. Note: Pyrethroid insecticide (Group 3 in Tables 1-2) applications make aphid management more difficult and can lead to outbreaks of aphids, thrips. and spider mites.